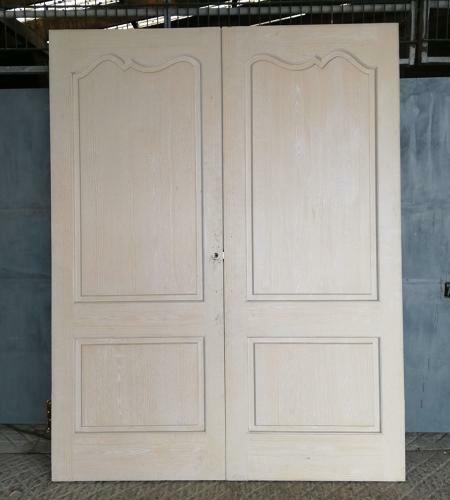 A pair of modern, reclaimed, pine French chateau style doors. The doors are very heavy and well made and are mortised and tenoned. The doors each have two panels and the panels are raised and fielded with the top panel featuring an attractive scroll design. The doors have a rebated edge and a rebate latch but this will need handles, to be supplied by purchaser. The doors have a painted internal face and the outer has an unpainted, waxed or varnished finish that highlights the attractive wood grain. The doors have all hinges and there are two brass coloured bolts at the top of the doors that will need receivers. The doors, although fairly modern, have been used and therefore have some slight signs of wear. One door has a thin surface split, not affecting the structural integrity of the door. Most of the door hardware has been removed leaving some small holes and marks. There are some knocks to the door corners and edges. One door has some paint residue, please see pictures for details. The doors could be stripped and repainted by purchaser to suit. The doors have a very attractive design and would make a wonderful feature within the home.